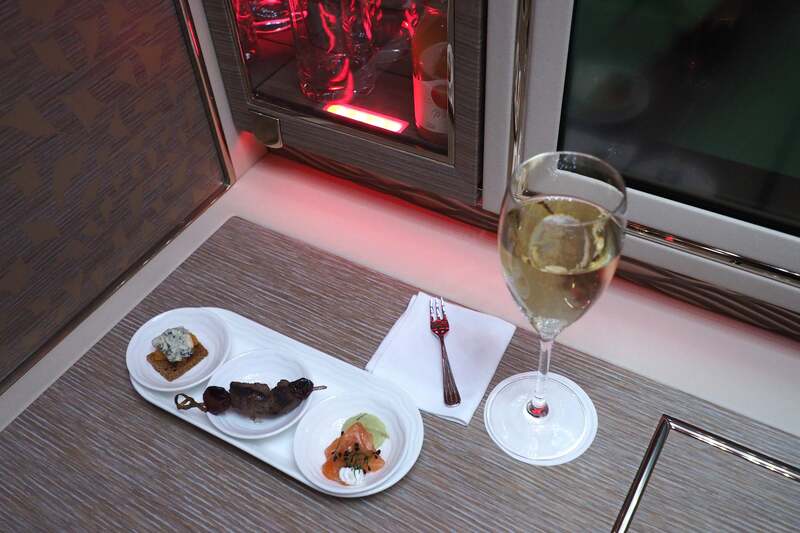 Emirates’ new 777-300ER is the best first-class product I’ve ever flown. 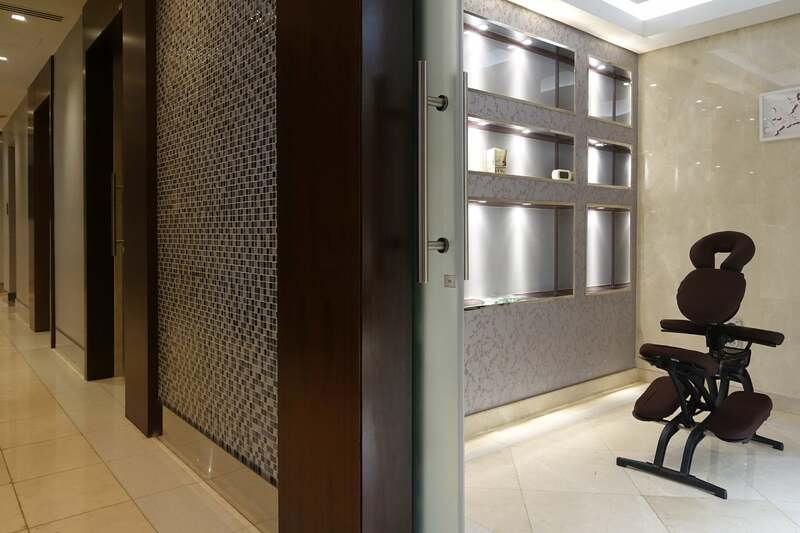 The Pros: Incredible design, unmatched privacy, tech features galore, fantastic catering, impressive lounge in Dubai. The Cons: No award availability, but that could always change. 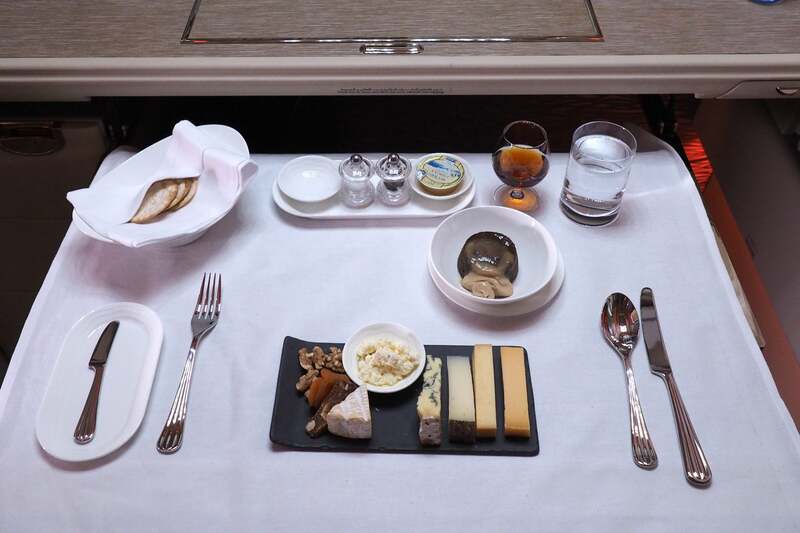 Once in a while, a truly unbelievable in-flight product comes around. 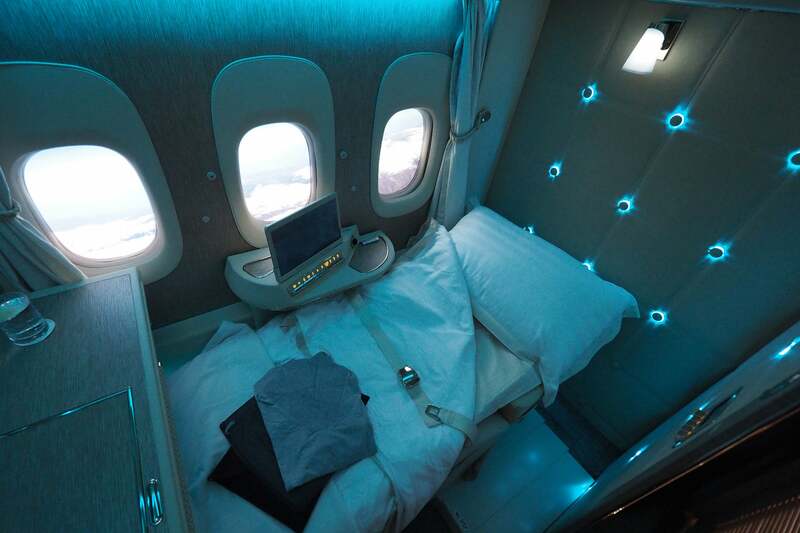 In 2014, it was the Etihad Residence, available exclusively on the airline’s A380s. 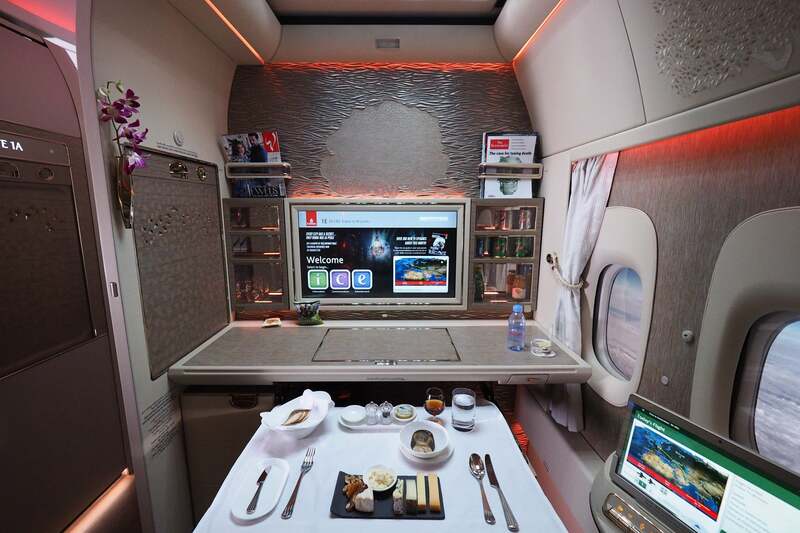 This year, Emirates took the Dubai Air Show by storm when it introduced a much-improved version of its first-class suite, just days after Singapore Airlines showed off a mock-up of its new — and similarly impressive — A380 cabin. 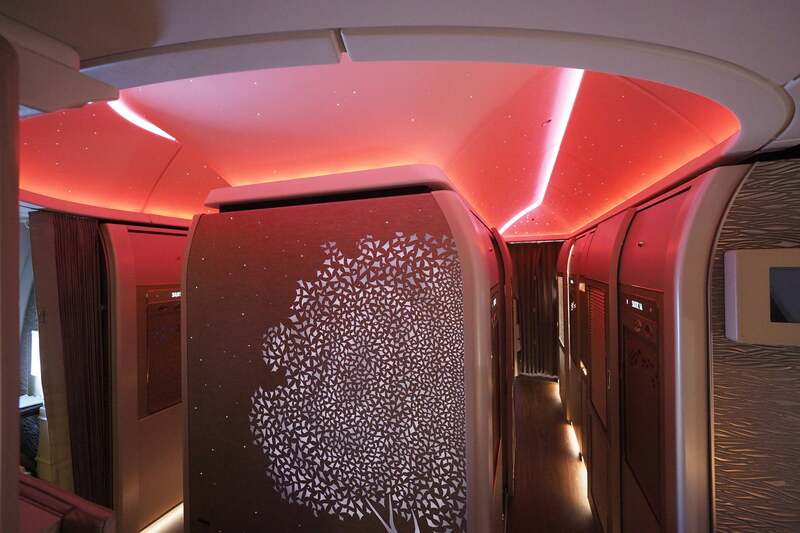 While Singapore’s version will take to the skies later this month, the new Emirates suite launched on December 1 on two of the carrier’s 777-300ERs — one operating flights from Dubai (DXB) to Brussels (BRU) and the second flying daily round-trips to Geneva (GVA). 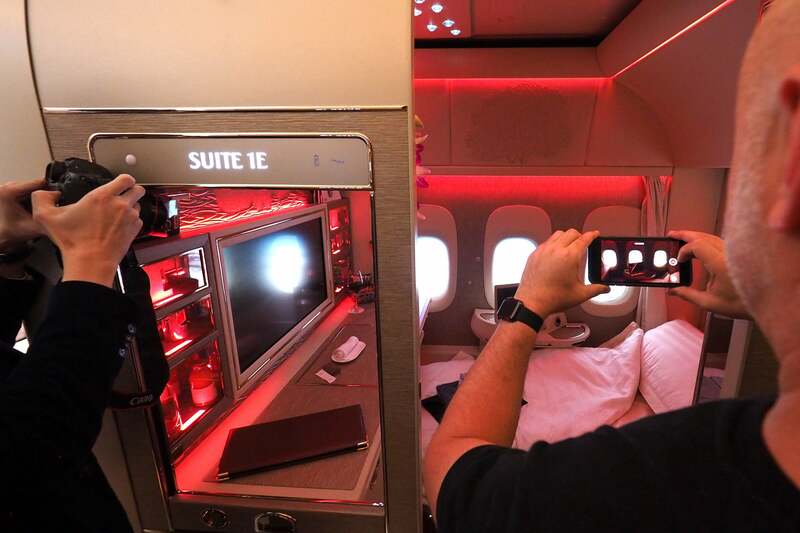 And I managed to snag one of the six suites on the airline’s inaugural flight. With no award availability — for now, at least — I had no choice but to book a paid fare. 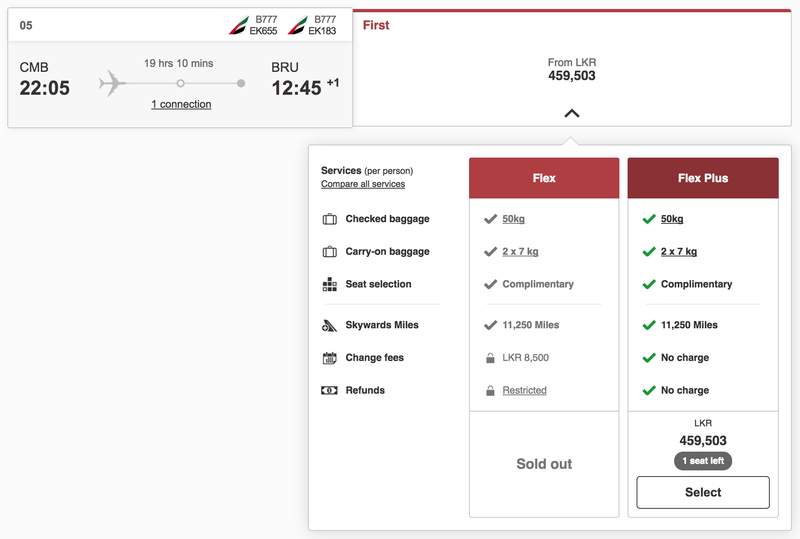 A one-way ticket from Dubai was running $5,500 for the flight I needed (EK183), but by adding a segment from Colombo (CMB) to Dubai as well, I was able to drop the price to $3,000. Saving $2,500 seemed worth the extra effort and travel, as I outlined in this post, so that’s exactly what I did. It also gave me an opportunity to fly the airline’s “old” suite, which I’ll compare to the new product soon. I selected a center suite, 1E, for my flight to Brussels, since I really wanted to try out the new virtual windows. 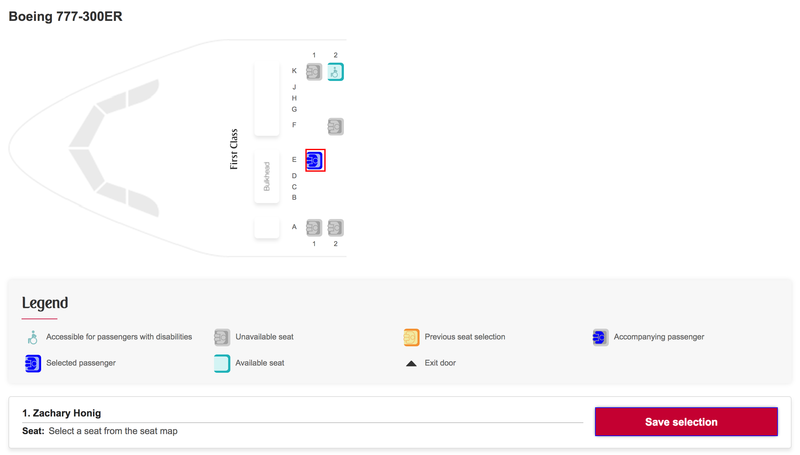 The only way to tell if you’ll have the new plane is to look at the seat map, which should match the 1-1-1 configuration below. 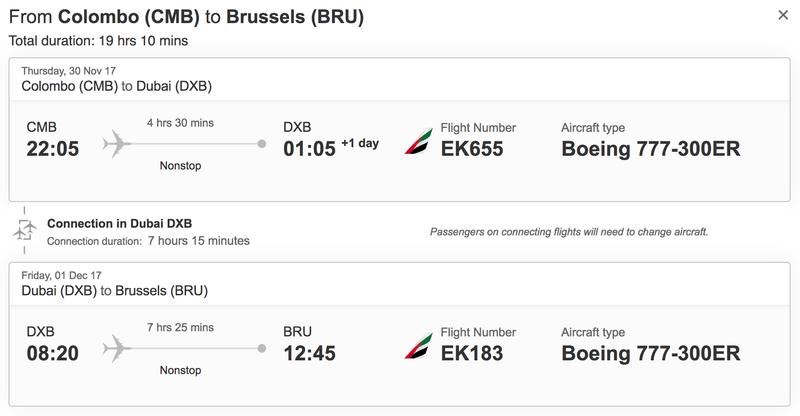 While there was an early morning flight that could have gotten me to Dubai in time for the Brussels connection, I didn’t want to risk it — instead, my routing left me with a 7-hour layover in the middle of the night. 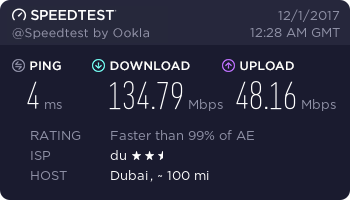 Normally I’d be dreading spending seven hours in the airport, but in this case I was actually looking forward to it — since I’d get to pass the time in the Emirates first-class lounge in Concourse A. 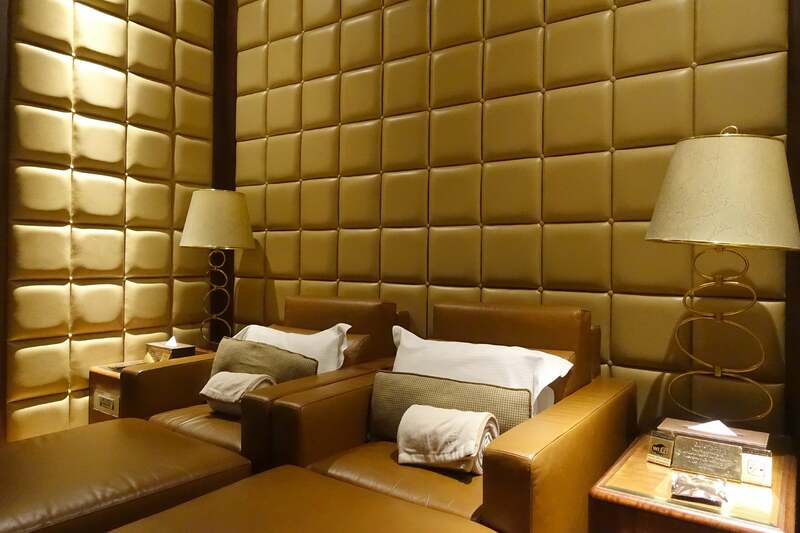 The first-class lounge is accessible to passengers traveling in first class on Emirates or Qantas on an Emirates codeshare flight, in addition to Emirates Platinum elites, who can bring one guest plus two children. 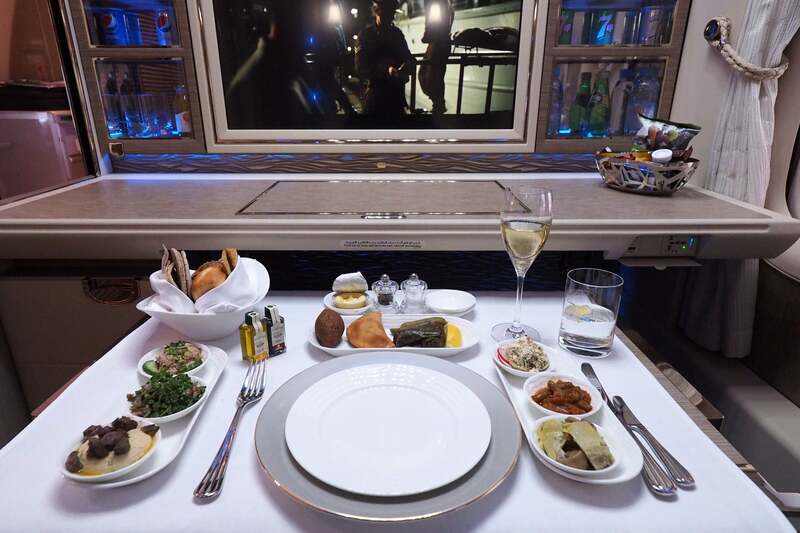 Additionally, Silver and Gold members flying Emirates or a Qantas codeshare with business lounge access can access the first-class lounge with a $100 upgrade fee, and non-members can purchase access for $250. 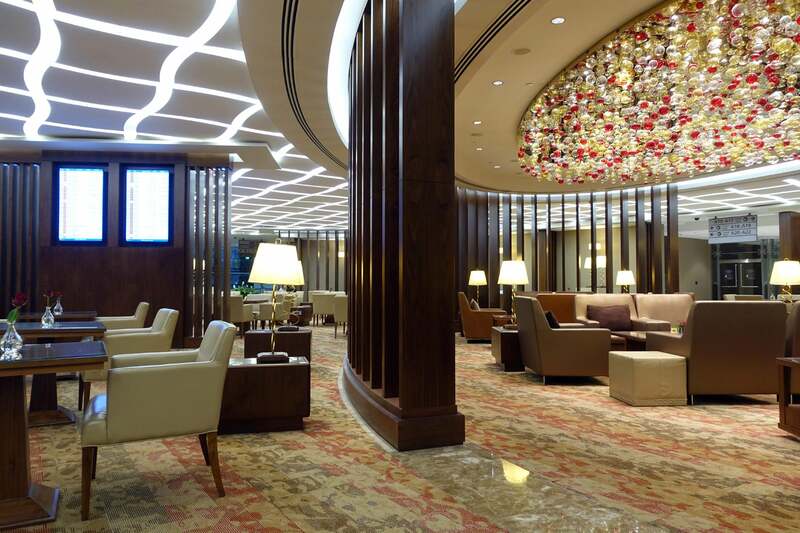 The first-class lounge is gigantic — it takes five minutes to walk from one end to the other. 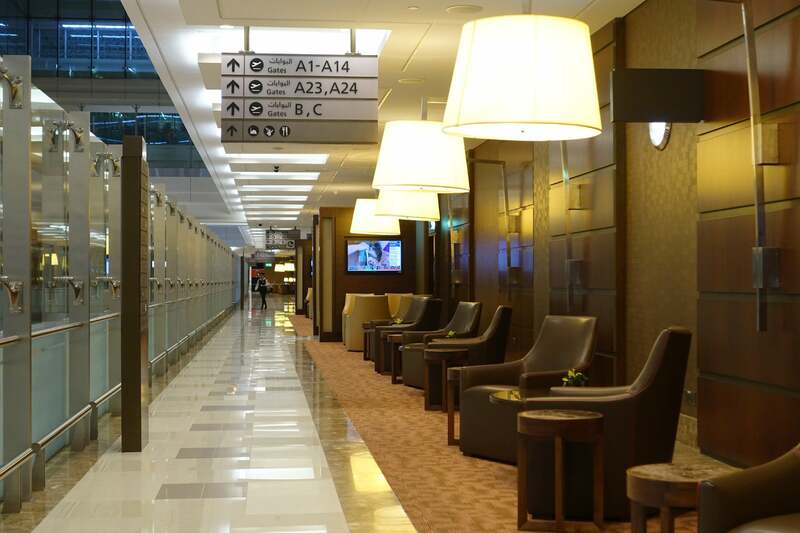 It spans the entire length of Concourse A, and you can board A380 flights directly from the lounge. It’s crazy big. 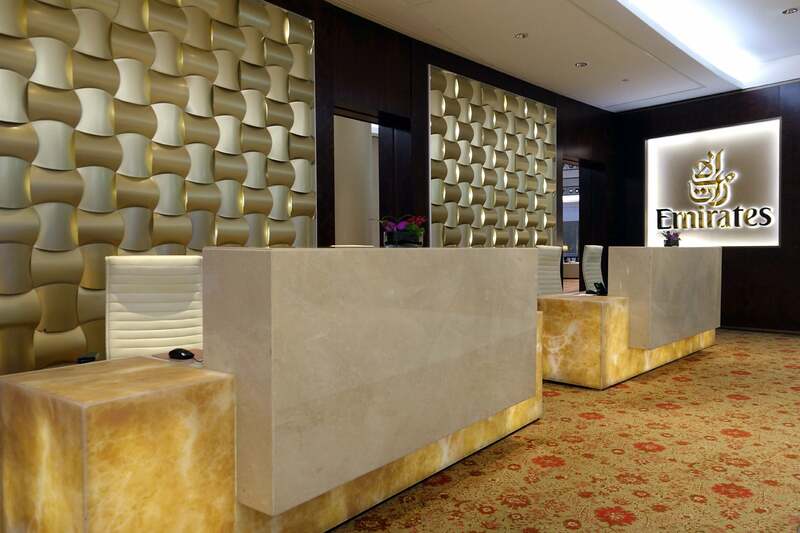 The lounge splits at the entrance in the middle, and most amenities are duplicated on both sides, so you’ll probably choose one end or the other. 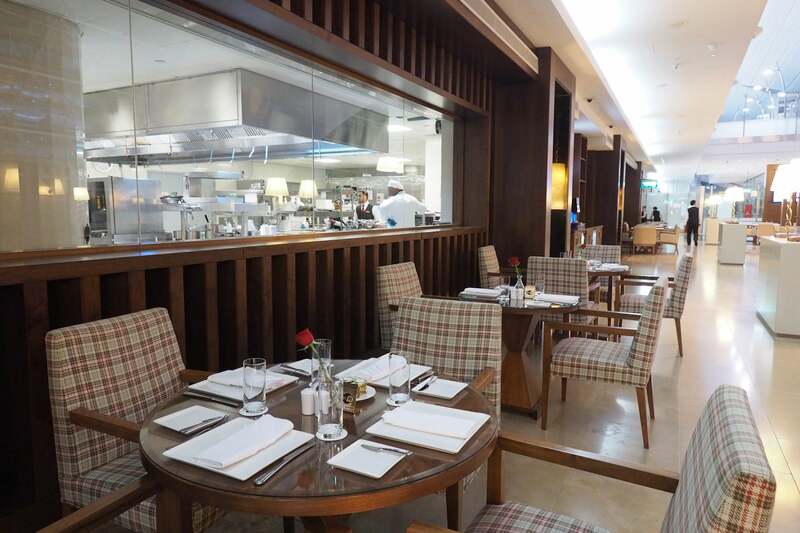 Both lounges have a sit-down “fine dining” area, for example, where you can order a range of restaurant-quality a-la-carte items. 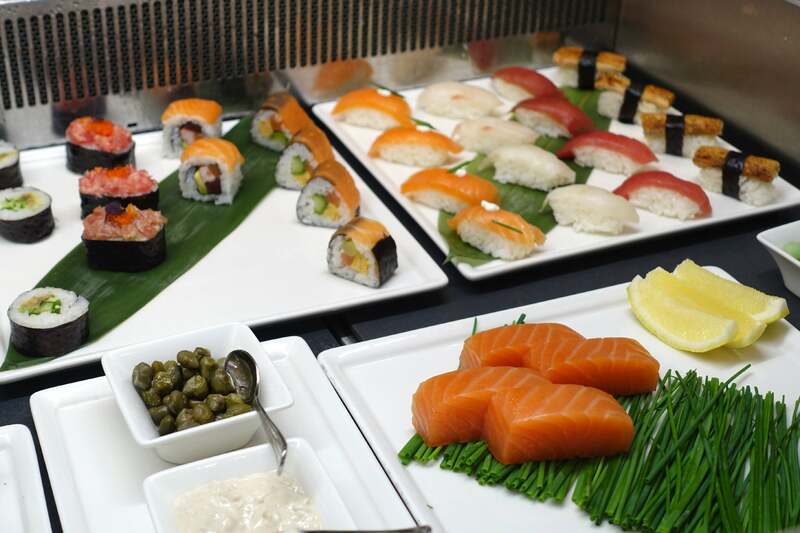 There’s also a sizable buffet, with hot entrees, mezze dishes and sushi. 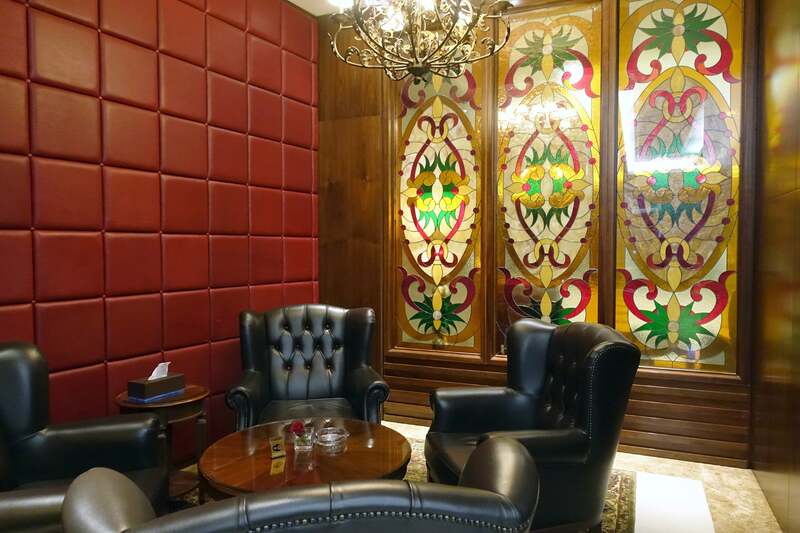 …and a cigar lounge for the adults. 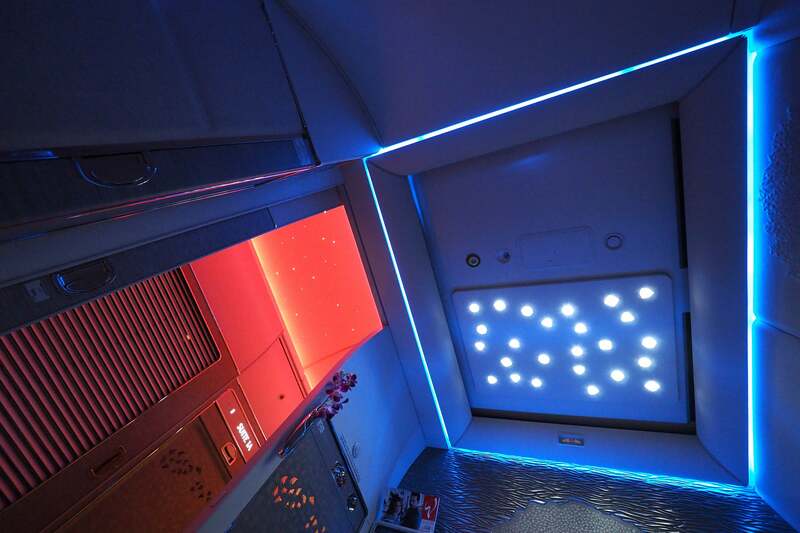 First-class passengers are also entitled to a free 15-minute massage — my back massage was great — and you can add time in 25-minute blocks for about $40. I tipped my masseuse $5, which she very much appreciated, but she didn’t seem to be expecting it. 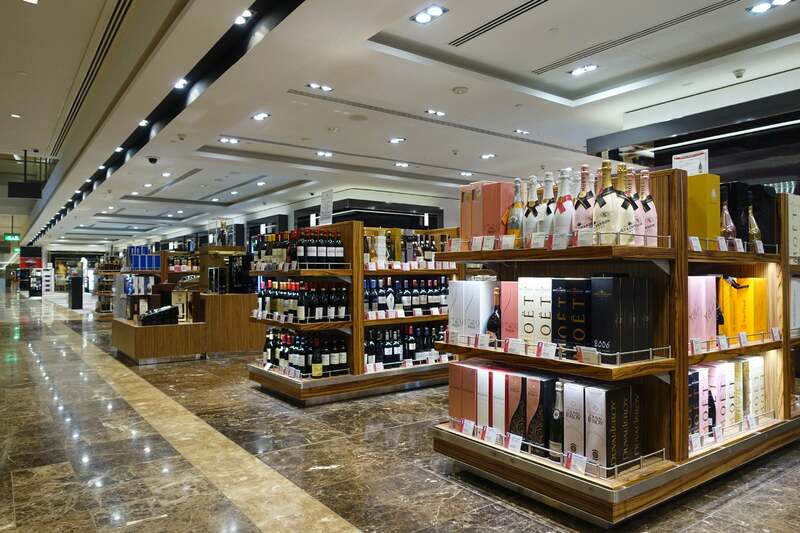 There’s also a well-stocked duty free store in each half of the lounge. 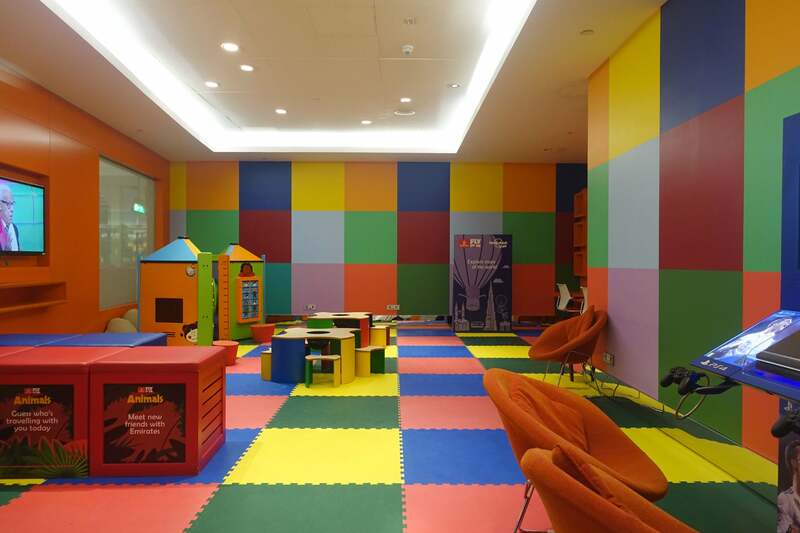 There aren’t proper nap rooms, unfortunately, but there is a quiet room with comfy chairs, pillows and blankets. And there’s loads of seating — this was my second visit and I’ve never seen more than a couple dozen people on each side, so you certainly won’t have any trouble finding somewhere to wait for your flight. 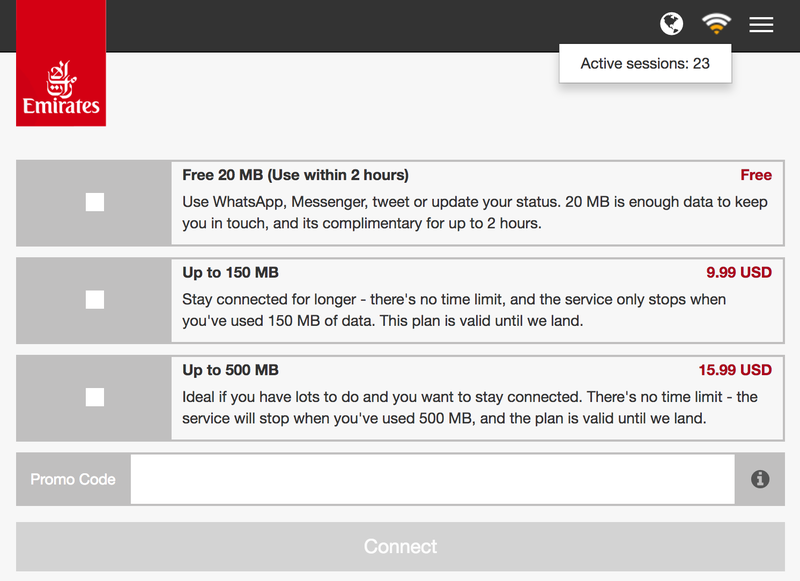 The Wi-Fi is outstanding as well, and it’s free, of course. With my luck, the only thing the lounge didn’t have was the one thing I needed at the time — an iron or press to get some wrinkles out of the shirt I had planned to wear for the flight. After a fair amount of back and forth, a lounge agent suggested that I ask the Hermès store in the terminal to steam my shirt, and to my surprise they were happy to oblige. Emirates should really have an iron or steamer on hand, though, especially since the agent said this is a frequent request. After several hours in the lounge I headed over to the B gates to check out my 777-300ER, which ended up being A6-EQH, the same plane I toured at the Dubai Air Show. The December 1 inaugural was the aircraft’s very first passenger flight. Lucky me! As seems to be the norm with this type of inaugural flight — a new plane or product on an existing route — there wasn’t any celebration at the gate. I was surprised to find that first-class passengers were asked to board last. The gate agent explained that the first-class cabin is entirely off-limits to all other passengers — the six of us had to board as a group so we could be escorted down a separate jet bridge. Fancy! With tons of video content planned, I was especially eager to board. Sadly, we only had about 10 minutes on the ground before it was time to push back, but that didn’t stop me from filming and uploading a tour. 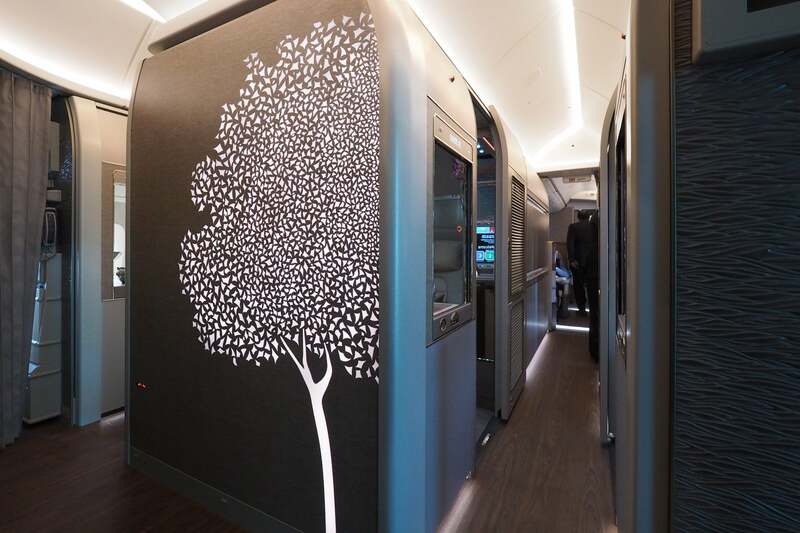 The first-class cabin is striking — it’s really a work of art. The suites are arranged in a 1-1-1 configuration, and center suites are actually a bit wider than those at the windows. There are two lavatories at the front of the cabin, and with just six passengers there was never a wait. 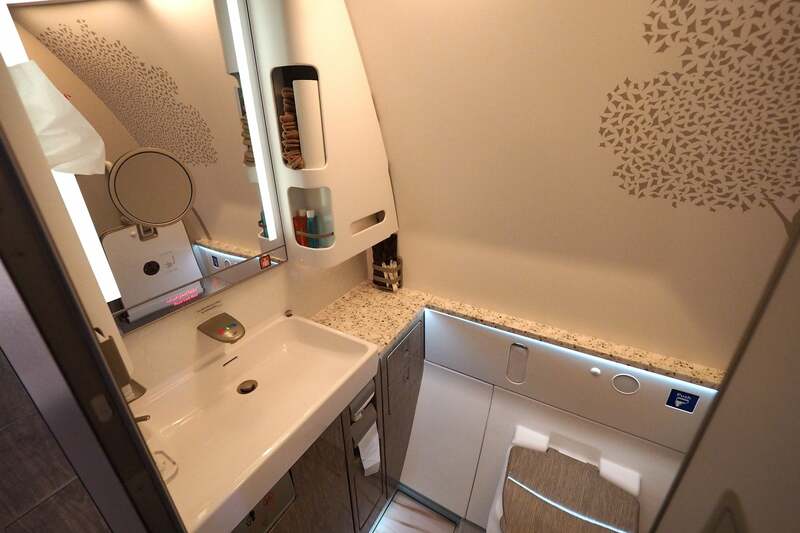 The lavatories aren’t huge, but they’re very well-appointed, just like the rest of the cabin. As it turns out, three of the six suites were occupied by enthusiasts — Kelly, from the US, Charles from Hong Kong and myself. Kelly also happened to be onboard my inaugural Qatar Airways Qsuite flight from Doha to London, so it was fun to bump into him again in Dubai! My suite, 1E, was actually the star of the show, since it was only one of two with virtual windows. Both Kelly and Charles wished that they had managed to snag 1E — it had been blocked prior to check-in, but I called the Emirates reservation line and the agent was able to assign it right after booking. I’m really glad they did — in my opinion it’s the best suite in the house, though all six offer incredible privacy. 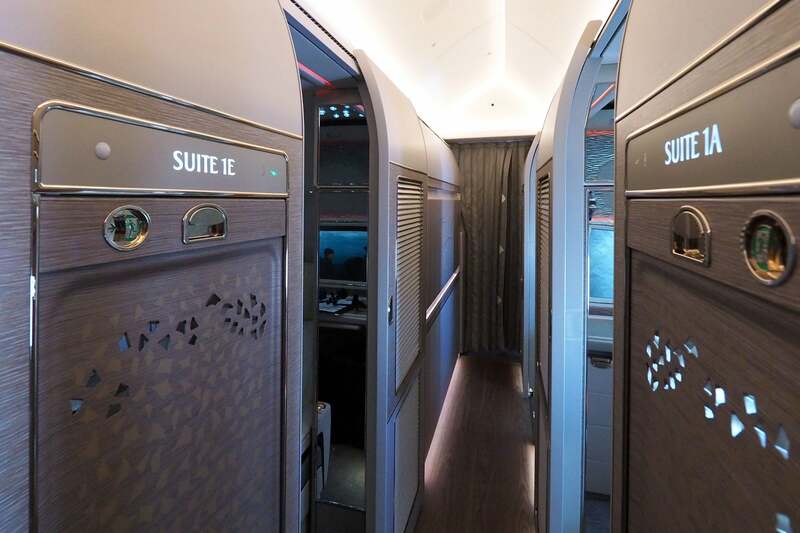 The suite feels very private, even when the door and service hatch are open — more on that later — but the privacy is incomparable when both are shut. 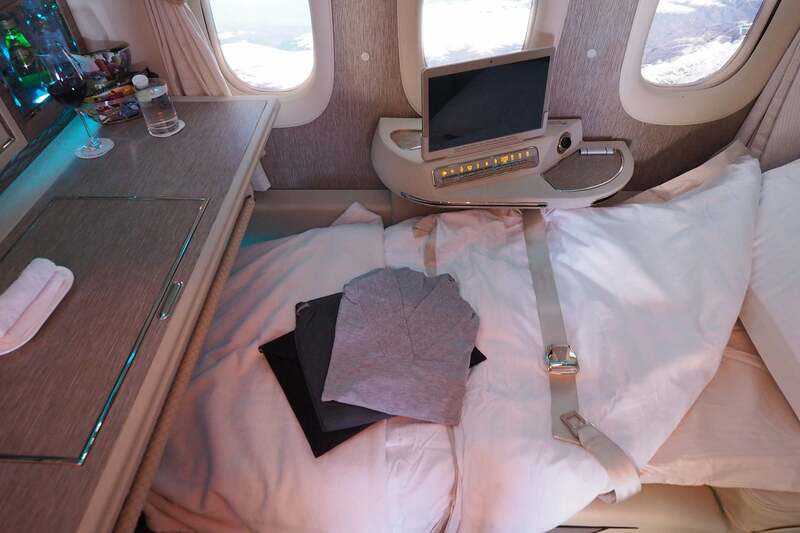 The seat was also very comfortable — the best I’ve had on a plane. 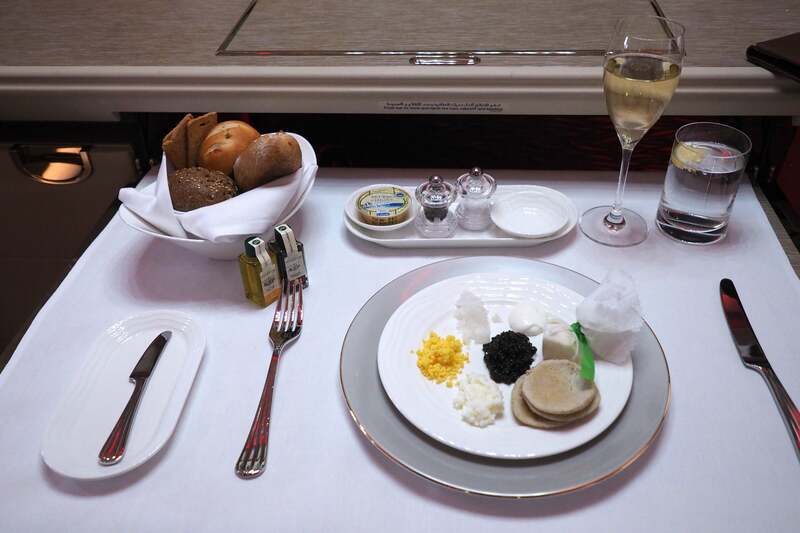 The Emirates first-class staples are still present here, too, but everything’s been redesigned, from the vanity to the mini-bar. 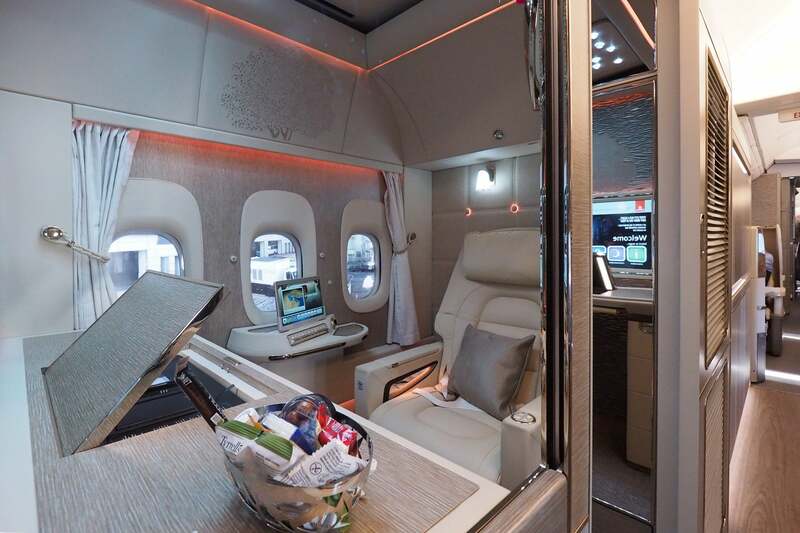 Emirates has been working with Mercedes-Benz on the design since 2014, which was inspired by the S-Class sedan — it’s clear that a ton of research went into every inch of the cabin. 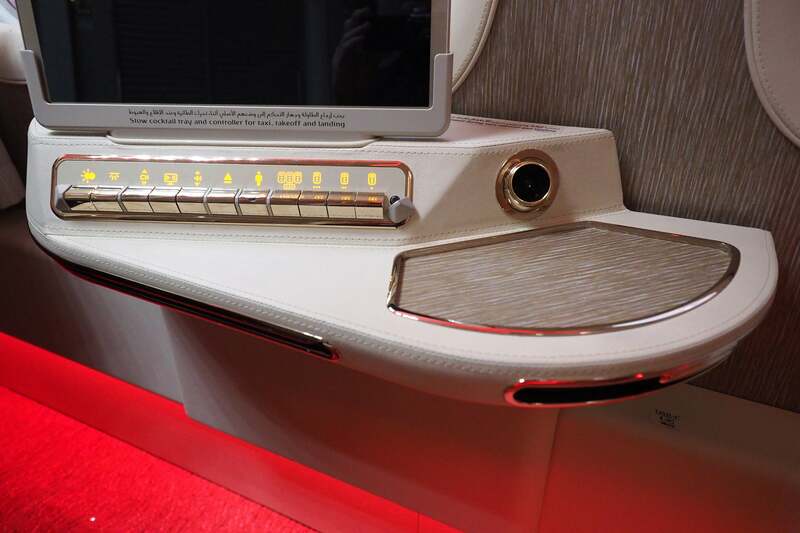 The level of customization is unparalleled, though Emirates still managed to keep all of the controls fairly intuitive — such as the especially basic seat adjustment options mounted in the armrest. My flight attendant used these controls to convert my seat into bed mode, as you can see in the video below. This was easily the most comfortable bed I’ve ever experienced on a plane. I really struggled to stay awake even as I was actively taking pictures — I ended falling asleep for an hour or so, though. There’s still plenty of room to move around with the seat in bed mode, and you can slide the full bed to either side if you need a bit more space. 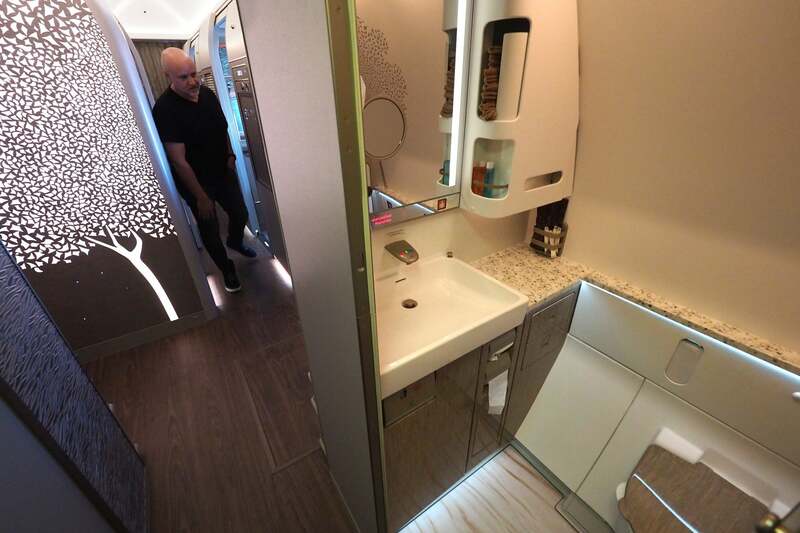 The only suite component that I’m not entirely sold on is the service hatch, which a flight attendant can use to pass food and drinks through without opening the sliding door. It feels a bit unnecessary to me, and my flight attendant still ended up asking to open the main suite door in order to deliver most of my courses. I kept my door open about half of the time, and I still found the suite to be very private — more so with the hatch closed and the door open, actually, given the position of the hatch. 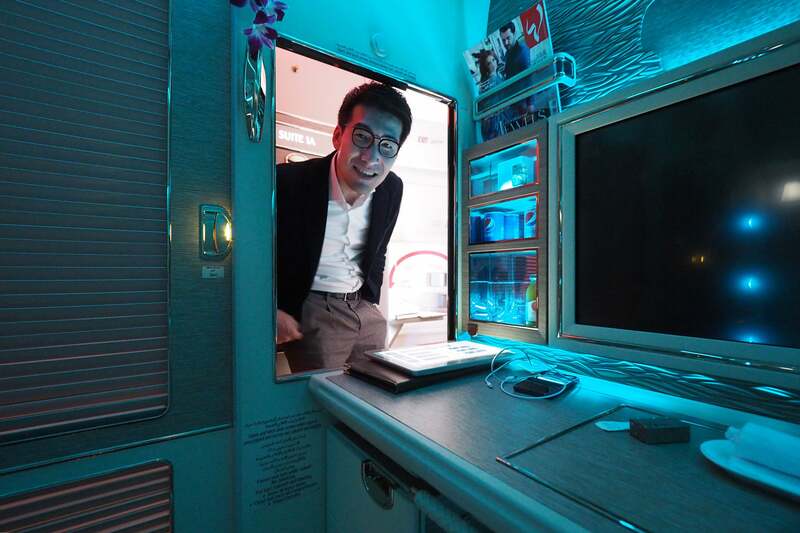 In addition to being the most private suite I’ve flown, it’s also the most high-tech. 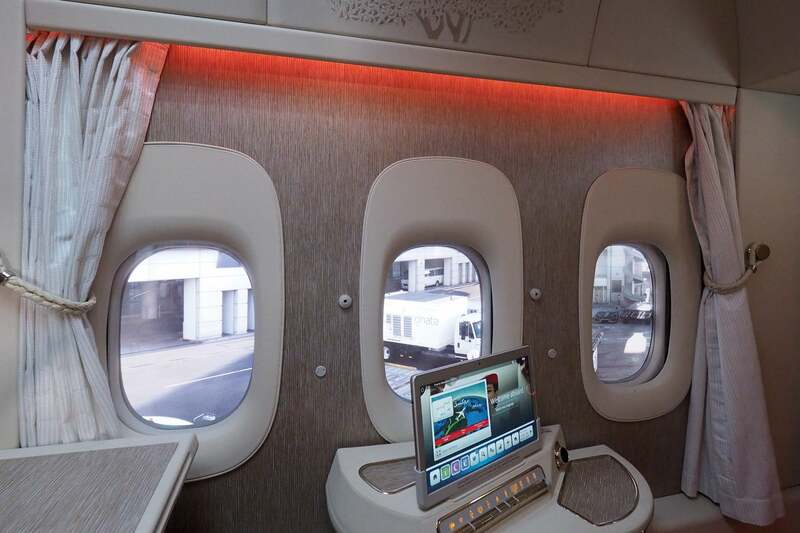 This is the first commercial aircraft to offer “virtual windows,” which I explain in more detail here. The virtual windows are probably my favorite feature — they’re just so cool! In my opinion they look even sharper than real windows, since there aren’t any scratches or dirt buildup to deal with. 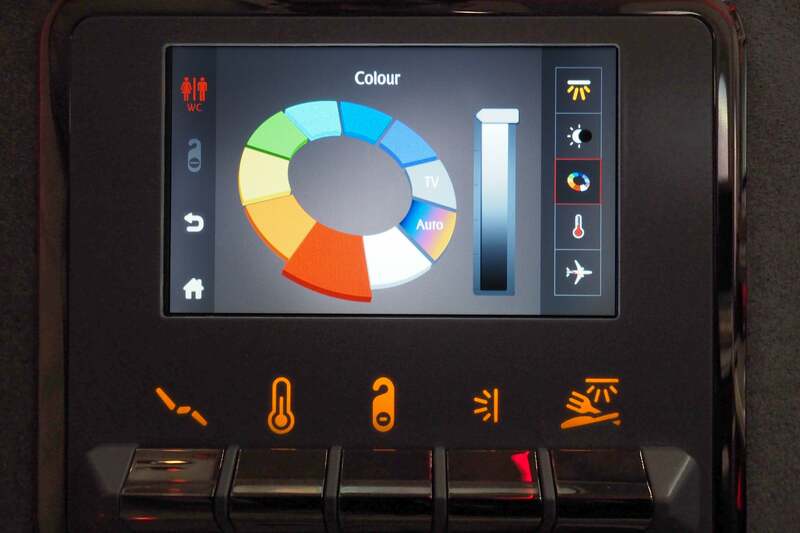 The suite controls enable you to adjust pretty much everything, from the temperature to the color of the ambient lights. I opted for blue for much of the flight, but I liked the red LED color as well. As for the temperature, I set the heat to “min,” and found that temperature to be comfortable, if not a little bit warm. 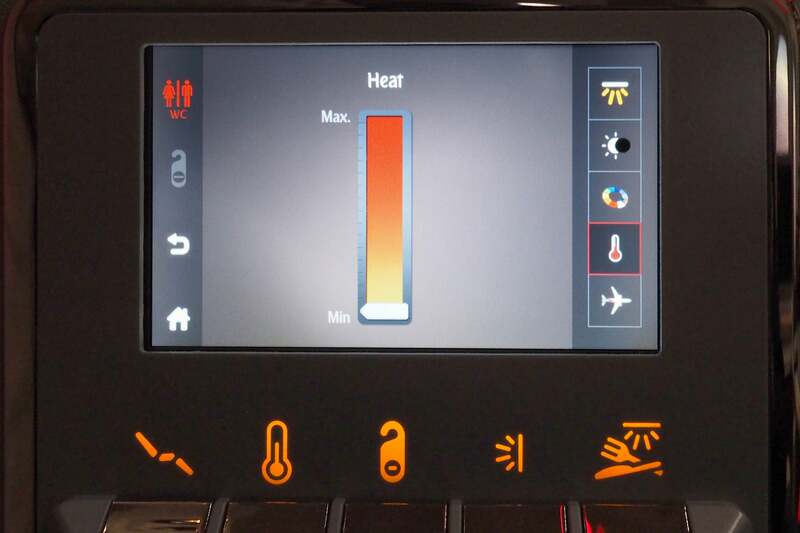 The suite also includes two adjustable air vents, including one built into the side unit and another mounted overhead. 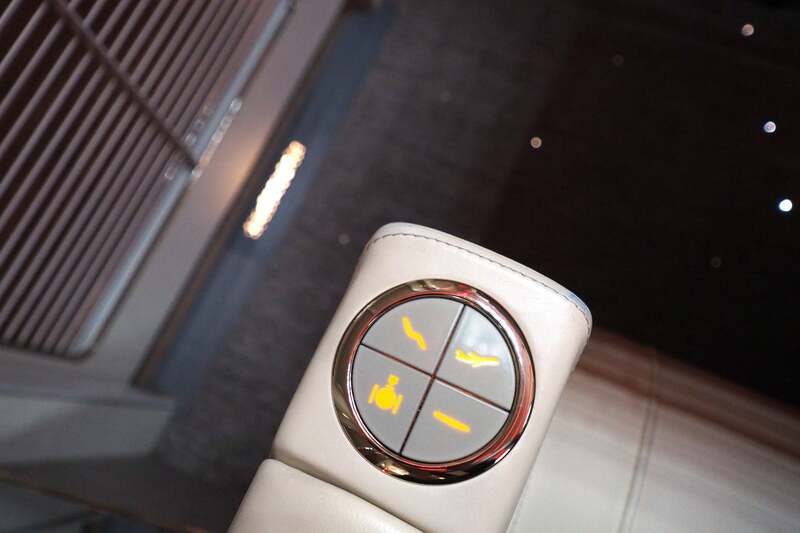 I really liked how customizable everything was — where else do you get to control the color of the lights in your seat?! The main overhead fixture was pretty slick, too — you can’t change the color, but the brightness is fully adjustable, which made it especially easy to capture sharp pictures during the meal service. I still can’t get over those virtual windows. How cool! 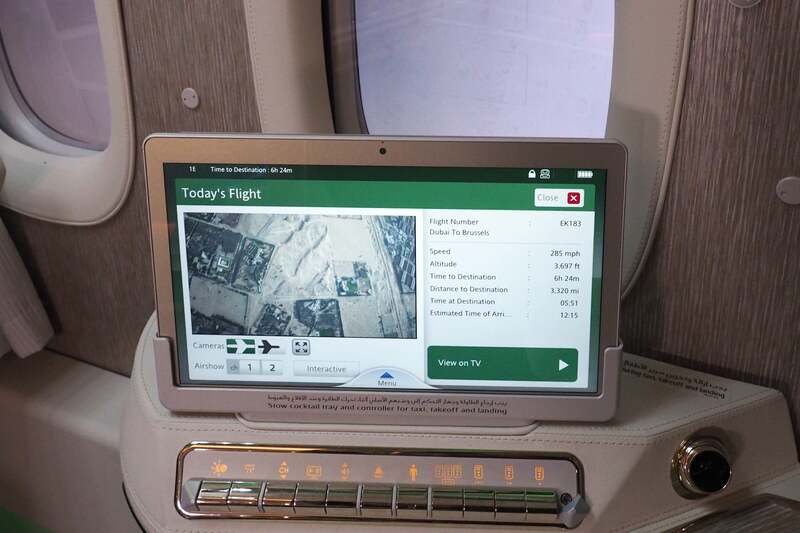 While the wall-mounted panel is used to control the lighting, there’s a 13-inch tablet that you can use to select entertainment, view the forward and downward-facing exterior cameras and chat with the flight attendant via video conference — a feature I’ll explore more in a future post. There’s also satellite internet, which is available for free to Skywards members with their frequent-flyer number attached to their current reservation. I was crediting my flight to Alaska, so I opted to purchase 500MB for $15.99, which ended up being plenty, even though I was uploading pictures throughout the journey. The performance was decent, but not fantastic — I was able to get one short video to upload, and photos weren’t an issue, but I wouldn’t count on getting too much web-based work done. 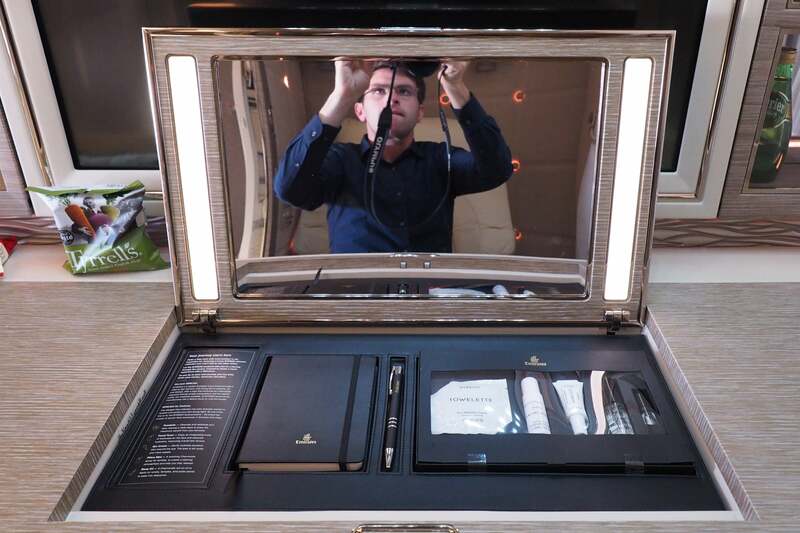 Emirates made a point of showing of its new amenity kits during the launch event, so I was surprised to find that they weren’t available on this flight. Apparently you only get them on redeyes, so our daytime flight wasn’t eligible. There were some comfortable “moisturizing” pajamas on offer, though — the medium set fit me very well. 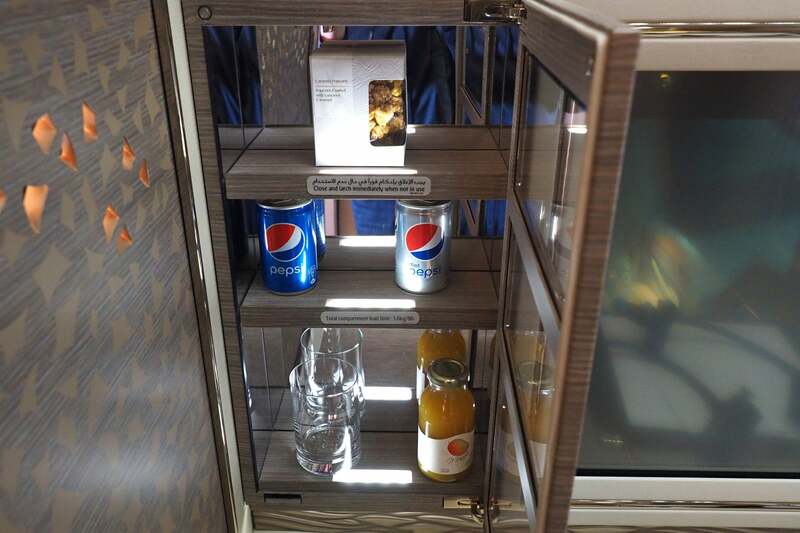 There’s also the famous Emirates mini-bar. This newer suite actually has two, positioned to the left and right of the main screen. Contents included still and sparkling water, soda, jelly beans and other snacks. 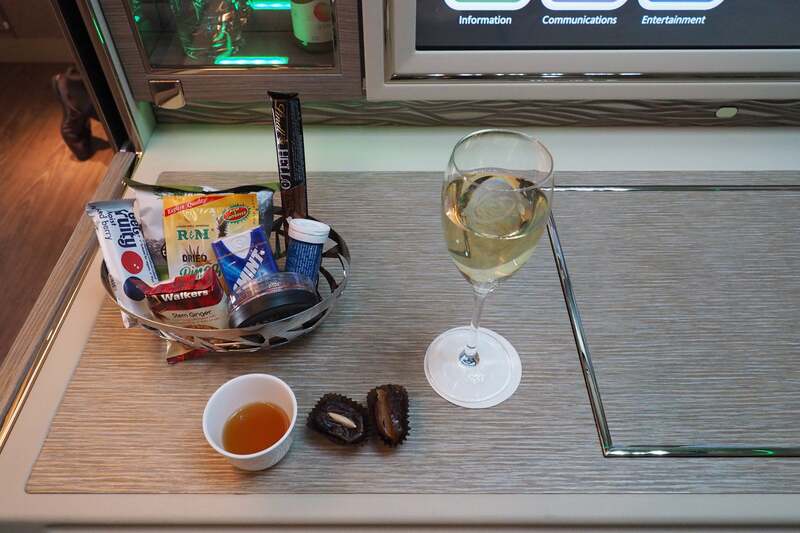 There’s also the same snack basket you’ll get on the older planes, with dried pineapple, caramels, chocolate, cookies and more. I didn’t touch any of the snacks or mini-bar drinks, though, since there was a full menu to explore. 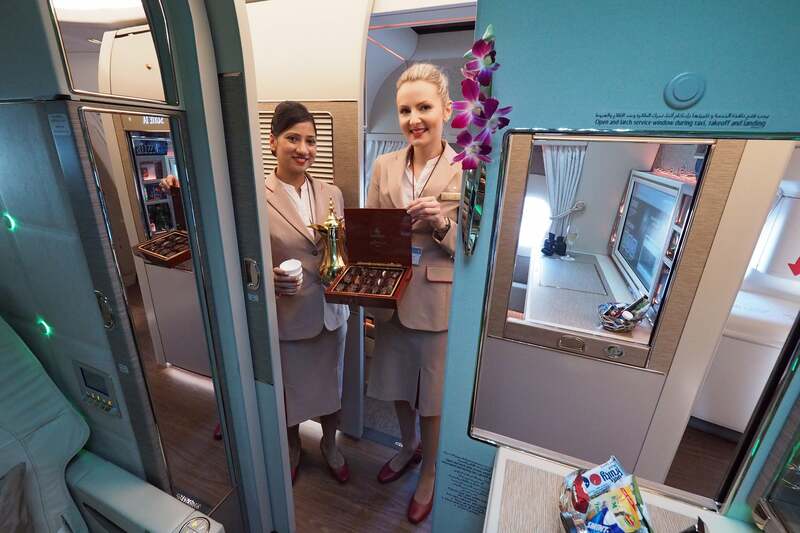 The service started with dates and Arabic coffee just before departure. There was a ton of food to choose from — I’m glad I didn’t finish everything I ordered in the lounge! 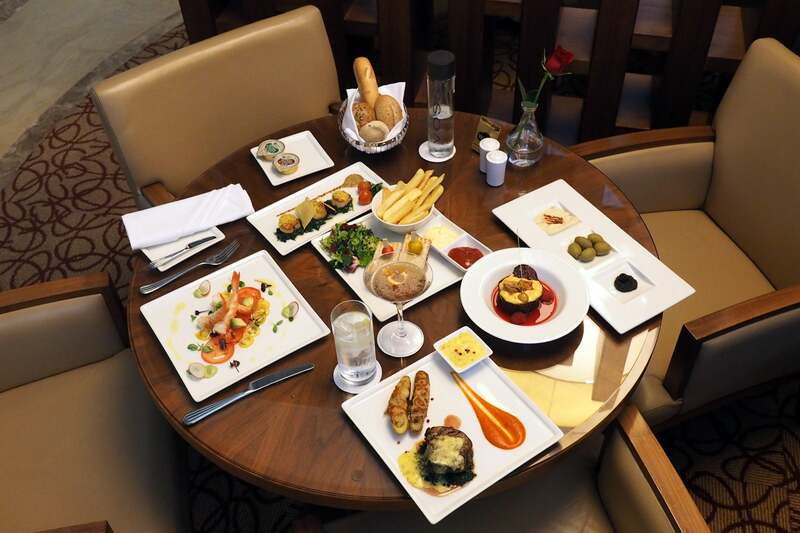 The menu was presented in a leather folder, and included different sections for food, cocktails, soft drinks and wine. I began with a glass of Dom Peginon Champagne, which was served with canapes, including grilled venison, smoked salmon and blue cheese. 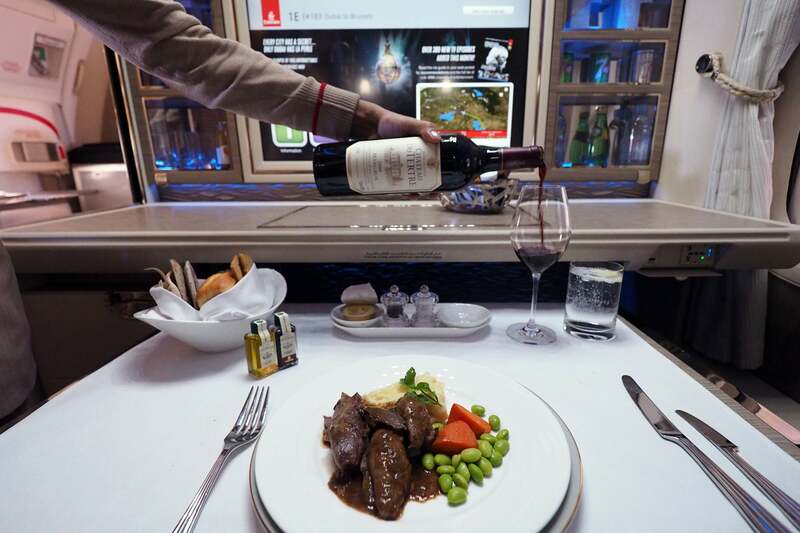 From there, you can order anything you’d like from the menu, to be served in any order at any time during the flight. It’s entirely flexible. 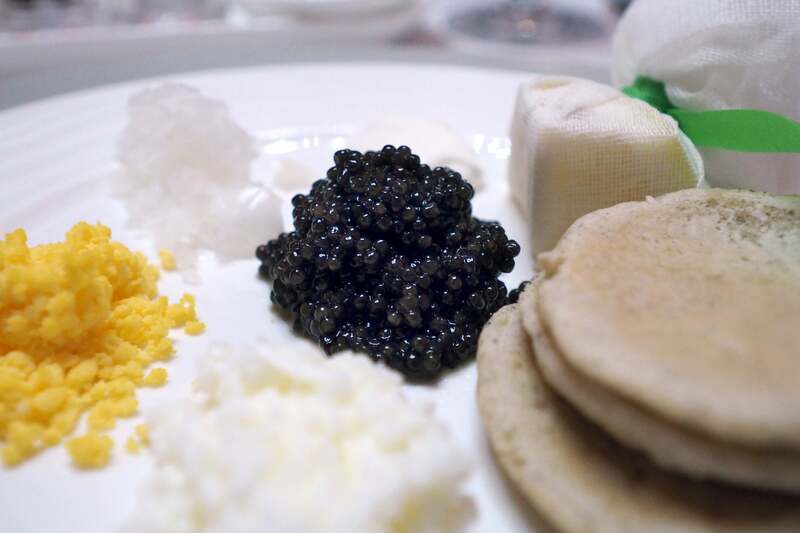 First, I ordered the caviar, which was served with all of the traditional accompaniments. It was perfect. Then I went for the traditional Arabic mezze, which would normally have been enough food for an entire meal — and then some! All of the dishes were delicious, and the fried items were still moist and flavorful. I had the braised lamb shank for my main course, which was also fantastic. The meat was flavorful and tender, and the veggies were cooked perfectly. 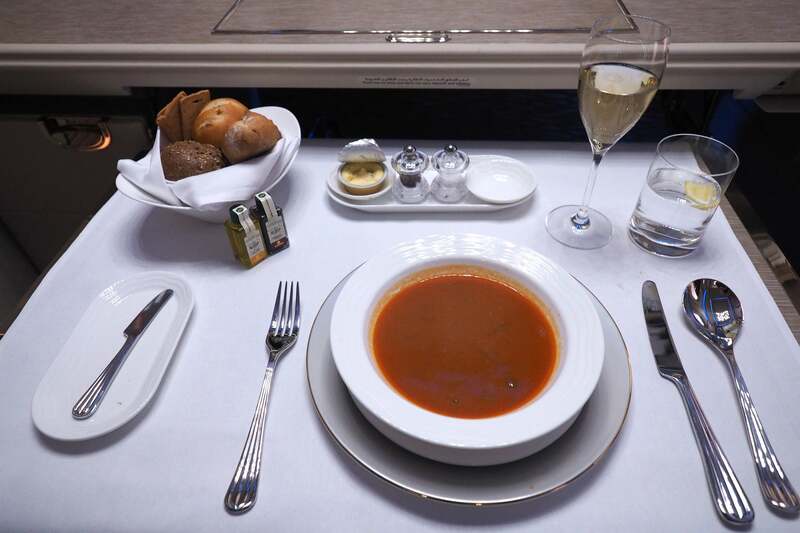 That was it for the main meal — I opted to save the cheese course and some sticky date pudding for later in the flight, which was served about 45 minutes before landing. 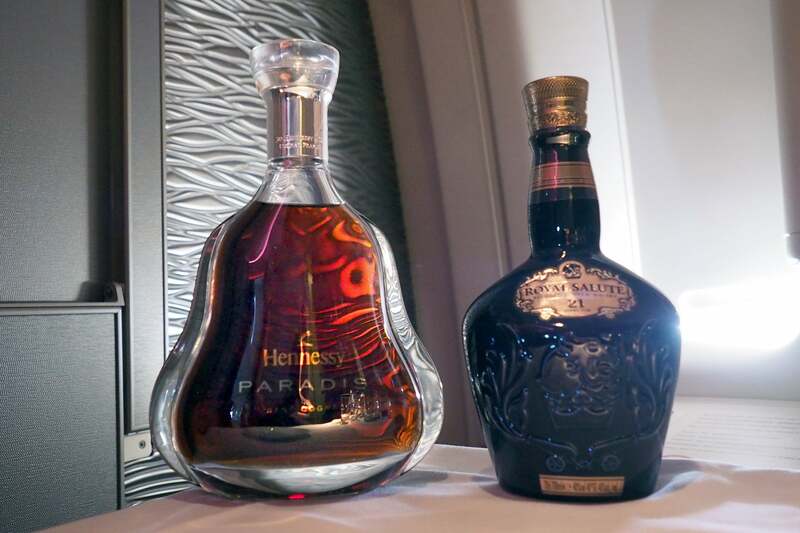 All of the beverage options were top-notch — Emirates serves liquor that I normally wouldn’t dream of ordering at a restaurant, including Hennessy Paradis ($700 per bottle!). 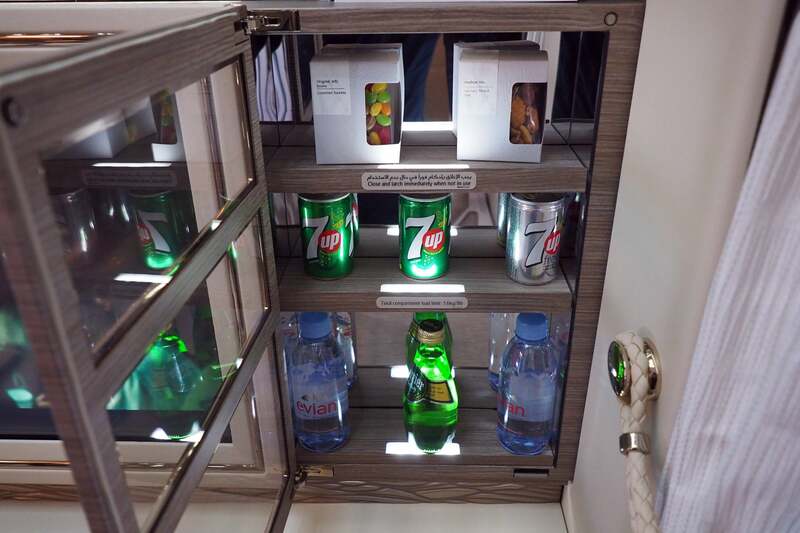 And then there’s also the mini-bar and snack basket, of course, but I’d save your appetite (and thirst) for the a-la-carte menu items. 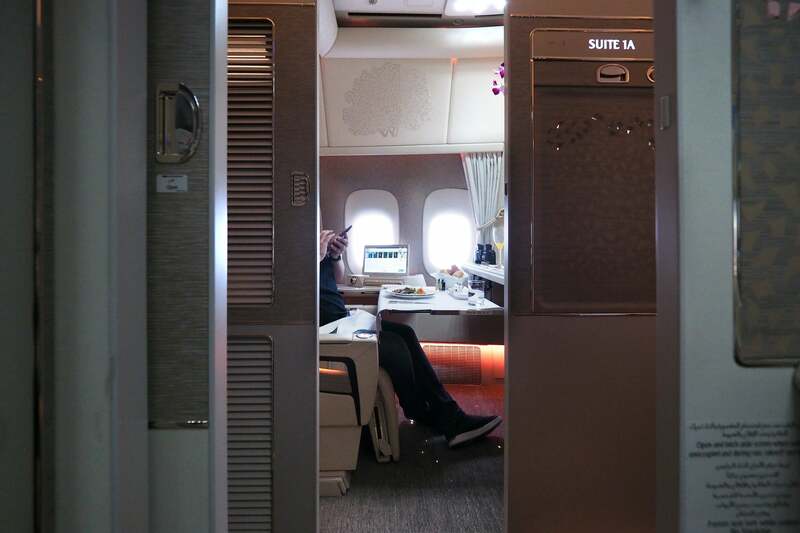 I’m rarely at a loss for words, but if I had to choose two to sum up my Emirates suite experience, they’d probably be HOLY CRAP. It’s just so impressive. 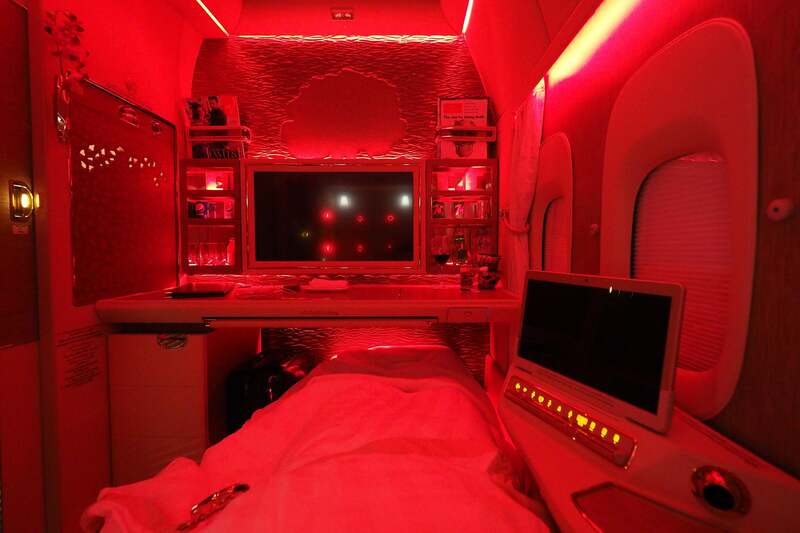 Emirates and its partners have done an incredible job bringing this concept to reality — I can’t think of a single thing I’d change. It’s just that good. 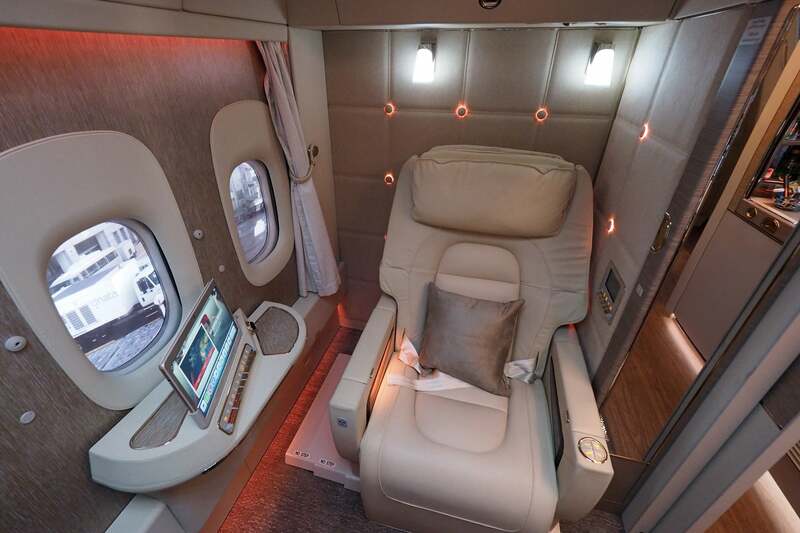 The only real downside here is that Emirates is currently blocking all but the most expensive (“F”) fare class on flights with the new suite, and that it’s only available on two routes at the moment. That means there aren’t any cost-effective options for using points and miles to fly, but hopefully that’ll change in the not-so-distant future. If you’re eager to fly it now, I recommend beginning your trip in a city known for especially low fares, such as Colombo, Sri Lanka.